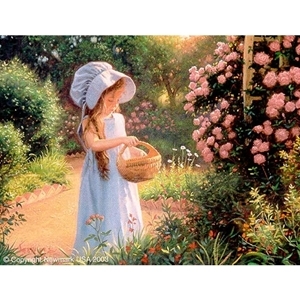 In his rendition of Basket of Petals, Mark Keathley captures a young girl harvesting flower petals. The desire to gather something beautiful regardless of age knows no boundaries. Once collected, her bounty (abundance) of flowers will be shared with everyone she comes in contact with. The basket may contain flower petals but it also contains love and hope for a wonderful life.